These tools help you interact with the map and purchase wind resource information on your desired site or region. Data & Maps: Select this product to order GIS data and PDF maps of an area. Visit the product page for more info. Predefined Regions: Select this product to order GIS data and PDF maps of a predefined area. Time Series: Select this product to order time series for a single point. Visit the product page for more info. Wind Resource Grid: Select this product to order a WRG for an area. Visit the product page for more info. Site Reports: Select this product to order a wind report for a single point. Visit the product page for more info. The compass is available with a Windnavigator Regional or Global subscription. The Compass provides instant site characteristics and wind data (200 m) at your specified point; location speed, display height, latitude and longitude, elevation, roughness, Weibull A & k (Wind Site Assessment subscribers), mean power density, wind rose, monthly speed distribution. Navigate the map window; zoom in and out, pan North, South, East, or West. Account: Links to the account details page. Review and update account information, add users, change password, and billing information. Help: Information to assist your AWS Truepower Dashboard Suite experience. Logout: Allows you to securely logout of AWS Truepower Dashboard Suite. Cart: Allows you to view the items you have added to your cart. Orders & Invoices: Manage pending and delivered orders, view your order history, and make payments on invoices. Store: Strengthen your Windnavigator subscription. Upgrade subscription level, add new regions, and add API services. Products: Information on all of the different available products. Subscriptions: Information on all of the different subscription products available. Pricing: Information on the pricing of various products and subscriptions. Support: Information to assist your AWS Truepower Dashboard Suite experience. Updates: Information on recent changes to the AWS Truepower Dashboard Suite. Contact: Contact form to allow you to get in touch with us if you have any issues or questions. Allows for navigation between the different dashboards. Clicking on the name of the selected dashboard will navigate you to the dashboard. Clicking on the down arrow will list the other available dashboards. Windnavigator delivers essential products to enhance your analysis of wind and energy resources at a prospective site or project area. Product deliverables range from 200 m PDF maps and GIS datasets to three levels of reports. PDF maps and GIS datasets can be purchased in one of two ways, Predefined Region or Data & Maps products in the Product Menu. Activate the product by clicking the green "Data & Maps" button or selecting it from the accompanying drop-down menu. The Data & Maps product uses the region tool ( ). Once the user has defined an area, click the "Set Area" button at the bottom left of the region tool. The area of the selected region and appropriate UTM zone will be populated in the product information area. The user can then begin the purchasing process by clicking the "Add to Cart" button. Define a hub height for the PDF Map, Wind Data and Vector Heights or use the default values. Choose your optional deliverables. Three optional Wind Data heights are available. The price will be automatically adjusted up or down if the optional Wind Data heights are included or removed from the order. Your item has now been created. To finish the order process go to Complete Order. Activate the product by clicking the green "Predefined Region" button or selecting it from the accompanying drop-down menu. Predefined Regions can then be selected from the product information area. The area of the selected region will be populated in the product information area. The user can then begin the purchasing process by clicking the "Add to Cart" button. Wind Resource Grid (200m resolution) datasets can be purchased by selecting the Wind Resource Grid product in the Product Menu. Activate the product by clicking the green "Wind Resource Grid" button. The WRG product uses the region tool ( ), they are available only for 25 x 25 km areas. 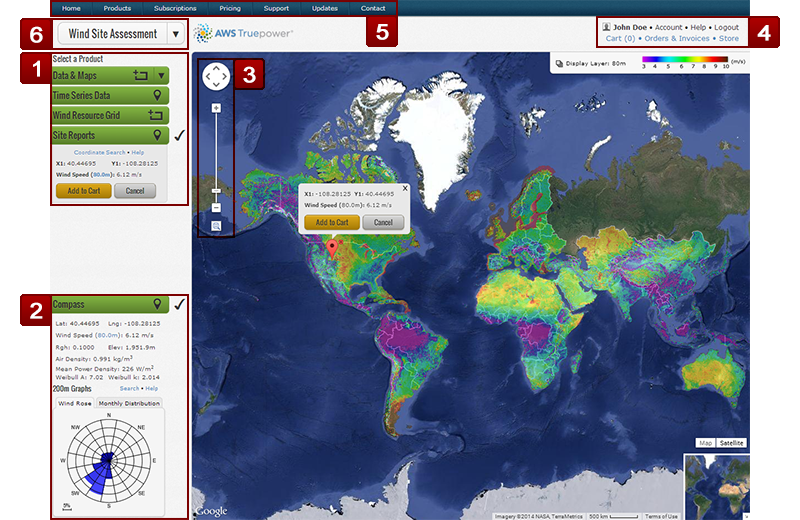 For this reason, the WRG tool will not display on the map until the user has zoomed far enough into an area of interest. Once the user has defined a 25 x 25 km area, click the "Set Area" button at the bottom left of the region tool. The area of the selected region and appropriate UTM zone will be populated in the product information area. Time Series datasets (Typical Year, WRF, and Global Reanalysis) can be purchased by selecting the Time Series product in the Product Menu. Activate the product by clicking the green "Time Series" button. The Time Serie product uses the point tool ( ). The user can order time series by searching coordinates or by selecting a single point on the map. If you are subscribed to the selected region, Compass data will automatically be made available in the Compass panel for the point. Define a primary hub height. Define any additional hub heights (limit 4). Enter up to three heights for MERRA and ERAI data. CFSR is only available at 22m while Hourly MERRA is only available at 50m. Enter a WRF site name. Enter up to three heights between 10 and 120m. Select 3km or 9km as a horizontal resolution for the run. Your item has now been created. Please note that WRF runs may take days to complete. Runs at 3km resolution will take longer than runs at 9km resolution. To finish the order process go to Complete Order. Reports can be purchased by selecting the Site Reports product in the Product Menu. Activate the product by clicking the green "Site Reports" button. The Report product uses the point tool ( ). The user can order a report by selecting a single point on the map. If you are subscribed to the selected region, Compass data will automatically be made available in the Compass panel for the point. Determine which report is the best solution for your needs: Basic or the Advanced Wind Site Assessment Report. If you are subscribed to the selected region, a free Compass data report is also available. The Basic Wind Site Assessment Report allows you to choose one turbine for energy production. The Standard and Advanced Wind Site Assessment Reports allow you to choose up to three turbine models for energy production. The Compass Report provides all of the data found in the Compass with a cover page. Select the hub height for each of the turbine models you choose. The default height will be based on the height previously viewed in the map window. After you have added all of the items you'd like to purchase to your cart, you can create an order and complete the checkout process. Click on the Cart icon to review your item. Please note, if you have multiple users under one account, only users listed as an approver or with no purchase limit can make a final purchase. Review your items for accuracy by clicking on the View Details link of your order. A pop up window will display your order. To edit or change an order click on the Edit/Change order. Please note certain changes will affect the price of the order. To retrieve a quote of the order, click the Get a Quote button. If all information is correct, you can add the item to the order by clicking the Add to Order link at the bottom of the cart item or by clicking the check box to the left of the cart item. When you have added an item to the order, the order total will be indicated above the Check Out button. Credit Card or ACH: Select this billing option if you want to use the credit card or ACH information you have entered into the billing section of your Account page. Invoice Billing: Select this option if applicable to create an invoice for your purchase. The invoice is available on the Orders & Invoices page for review, printing and payment. You are able to pay the invoice online with a credit card or ACH payment or you can contact AWS to make payment using a PO or check. Orders being placed using the Invoice option will be processed before payment is received if: 1) the user is an active subscriber (excludes Day Pass), 2) the account has no outstanding invoices, 3) the order is not for a subscription upgrade, and 4) the amount is under AWS Truepower's automatic processing limit. A billing invoice is available on the Orders & Invoices page for printing. Upon completion of this order, you will receive an email confirming the purchase and any charges that may have been applied to your credit card or bank account. Most AWS Truepower Dashboard Suite orders will be available for download within the hour; however, depending on the size of the area of interest and data requested some orders may take up to 24 hours to process. Orders will be delivered to your account Orders & Invoices page. You will receive an email confirming your order once you have completed a purchase. Once payment has been received, your order will be processed and you will receive a follow-up email notifying you that your order has been delivered to your account and available for download. On the Orders & Deliverables page locate your order and click on the black triangle next to the order number to expand the item window. You can then view details of the order and if the item has finished processing download the item. The time required to deliver your file will depend on the size of your purchase and your preferred payment method. Typically most project-scale purchases will be delivered within the hour. In the event that your order will require more than 48 hours to process, you will be contacted by an AWS Truepower representative. If you would like to update a previous order to include an expanded area or additional optional data, a fee of $75 will apply for a PDF purchase and $125 for a GIS purchase. To update an order, please contact us directly by calling +1-877-899-3463. For technical questions or billing inquiries concerning the AWS Truepower Dashboards, or other products and services, email us or call us: +1-877-899-3463.